Railroad workers in 1910 one mile west of Regent, North Dakota. I just finished a lunch of homemade chicken soup (with lots of fresh lemon juice and cilantro), and before I grab a coffee and get back to the busywork, I thought I would upload a photo of historic railroad industry in western North Dakota circa 1910. 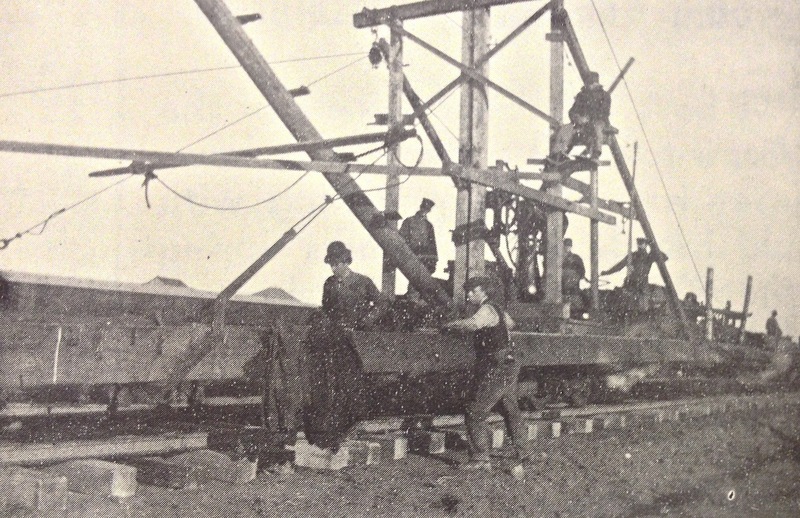 The photo was taken about a mile west of Regent, as track was being laid to connect the rural agrarian areas of the American interior with the city centers and rail hubs of Dickinson, Bismarck-Mandan, Fargo, Minneapolis-St. Paul, and so on. Looked at from an agrarian context, railroad construction was big throughout the world at this time, as nation-states increasingly relied on agricultural production to feed an ever growing populace, and this led to increased competitions over global resources. I suppose a modern public historical treatment of pumping Euro-Americans into colonizing the continent’s interior might come by way of AMC’s “Hell On Wheels” or HBO’s “Deadwood,” a kind of post-Civil War historical days of our lives with amplified skull-duggery, dodgy behavior, and shenanigans. But don’t simply rely on Hollywood to shape the way the past is understood. It’s best to get into those archives and see the documents for yourself. This entry was posted on Monday, September 30th, 2013 at 1:17 pm	and tagged with Dakota Territory, Deadwood, Man Camps, North Dakota, Railroads, World History and posted in Uncategorized. You can follow any responses to this entry through the RSS 2.0 feed. Love the last two lines of this post. Hollywood tells a great story, but it’s always best to research for yourself.